American Funds Fundamental Investors A (ANCFX) fund is one of popular U.S. domestic stock mutual funds. This American Funds fund invests in US stocks. Large Cap US Domestic Stock funds have achieved better result than other Large Cap International stock mutual funds for 2011. One of this popular US Stock funds is American Funds Fundamental Investors fund. This top fund also pays regular dividend. More details about the fund review below. The investment objective of American Funds Fundamental Investors fund is to seek long-term capital growth and income. This American Funds fund invests mainly in common stocks of companies that appear to offer superior opportunities for capital growth and most of which have a history of paying dividends. It may invest significantly in foreign companies outside the United States. turnover (as of November 11, 2011) of 32.00%. The fund total net assets are $47.51 billion. This American Funds Fundamental Investors fund has 4-stars rating from Morningstar. It has 27 years of positive return and 5 years of negative return. The 5-year average return is 1.14%. The best 1-year total return was recorded in 2009 with 33.36%. Based on the load adjusted return, this large blend equity fund has returned 5.62% over the past 10-year and 9.85% over the past 3-year. The 3-year beta is 0.98. There are 75 brokerages that provide this US domestic stock fund for buying or investing. They are E Trade Financial, Merrill Lynch, Vanguard, JP Morgan, Edward Jones, Royal Alliance, Raymond James, Firstrade, Scottrade Load, etc. To start investing in this mutual fund, investor will need a minimum of $250. This amount applies for both brokerage and IRA account. There is a minimum of $50 for the next investment needed. The 12b1 fee is 0.23% and the front-end sales load fee is 5.75%. It uses Lipper Growth & Income Funds Average as the fund’s benchmark. As of October 31, 2011, the 10 largest equity holdings are Merck, Home Depot, Bristol-Myers Squibb, Union Pacific, Apple, Verizon, Microsoft, Dow Chemical, Royal Dutch Shell and Suncor. 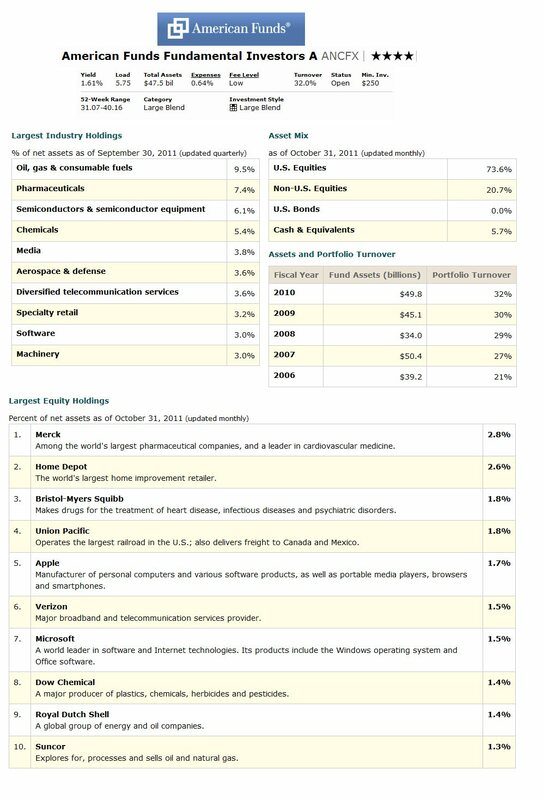 The five largest industry holdings as of September 2011 are Oil, Gas & Consumable Fuels (9.5%), Pharmaceuticals (7.4%), Semiconductor & Semiconductor Equipment (6.1%), Chemicals (5.4%) and Media (3.8%). Investing in this stock fund involves risks such as market risk, investment style risk, foreign investment risk, management risk, and more.